This lesson introduces the science of tsunamis: their causes, initiation process, properties, propagation, inundation, and long-term effects. 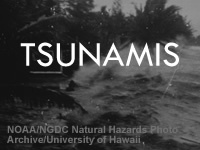 Through numerous animations, historical images, video, and interactive exercises, learners discover the ways tsunamis interact with and affect the world. The lesson is intended for Weather Forecast Office staff — particularly National Weather Service Warning Coordination Meteorologists — who desire a better understanding of tsunamis in their role as issuers of tsunami warning-related messages. But it will also benefit anyone wanting to learn more about how tsunamis work, including emergency managers, broadcasters, college and high school students, and the general public. it was very interesting and very informative. I learned a lot about Tsunami's that I never knew before. Quiz doesn't give you the answers at the end.... It's really frustrating because you don't know what answers you're getting wrong on the stupid 'select all that apply' questions. It was a very challenging test but nevertheless it was fun. I just hope they give the answers to the questions that were marked wrong. I took the test 10 times and I can't pass it. I learned a lot of new stuff about tsunami. I am disappointed that my grade is lower than I expected because I was told that I did not do my home works. There is a problem that I struggled with, which is how to find my home work on Laulima. In the beginning I attempted to do home works I have a hard time locating at home in the evening especially. My problem, is that I don't have adobe flash and can't get it in my computer at home that has a program that is set for school. I'm a full time student so I can't do everything in the day time to make up for my home works .Although it was set on Laulima I have to locate all my home works via other websites. On top of that I have to screen-shot it, and send it in to the Instructor. What type of system of this, that it's hard for us students to comprehend to follow the directions just to do our home works, and to be submitted. Very engaging and challenging. Put me to the top of my game, had to be prepared and ready. I like that type of challenge, it motivated me on many levels. I would rate this lesson at a 5. I enjoyed the lessons on MetEd. Clear to understand and with the many illustrations, it helped to visualize what I was reading. Was extremely, confusing. To in depth for beginners. I found the content to be an egaging and effective way to learn about tsunami and earthquakes. Great lesson to deepen your understanding of a complex hazard. Yes it gets a bit scientific, but I believe it's a must for any Emergency Manager facing the tsunami hazard. This was a fantastic course for my college class. It helped put everything together. Great experience and learned a lot of what a tsunami can do to us on a small island. so this helps me how to take these things seriously. Lessons were okay though the narrator was talking a bit too fast so I had to re-watch parts. This experience of learning about Tsunamis was very interesting and many information was brought to my attention. I think putting a subtitle in all the video clips will be much more helpful. The tape recording (audio) is not too clear. Need more time to review materials. This one about the Tsunamis was a tough one, I will make you work for it, but you will walk away with a lot of knowledge. I feel the Q and A is a bit odd - almost designed to trip the student up in their answers. Not sure how conducive this method is to learning, but I've taken securities exams, they're more difficult. very rare lecture in my life, and very helpful. There's a ton of missing information. No written text. The quizzes don't coincide with the information in the videos. This was very confusing. Multi part questions should show points earned for partially correct answers; in current form unable to tell if one part of five was correct, all but one correct, or all wrong. This makes students more likely to guess randomly if they become confused. This also does not promote learning because if all but one part was correct, students might think all parts were wrong and learn incorrectly. Also very hard to find answers in material when trying to understand why an answer was marked wrong; different wording and terms used in instruction verses test makes this very confusing for students who do not know the subject area. Great interesting topics that enlightened my knowledge of tsunamis. Very good.Nice browsing and I've learned a lot. this topic gives us a more broader and wider understanding of tsunami characteristics. this is all on the lob training, FEMA-HOMELAND SECURITY, DOI, USGS, USDA,NOAA,ETC. This module is absolutely indispensable for anyone looking for a very wide and complete understanding of the Tsunami phenomena. You won't find any other course like this out there! This Module was very informative, easy, and fun. I learned a lot that I didn't know about Tsunamis. Good--although I would have liked the module to be updated with information on the Fukushima tsunami. This course did a very good job of explaining the basic properties of tsunamis. The image maps where we had to determine the type of hazard was an excellent learning tool. Describe the major triggers of tsunamis and how they generate waves. List the major types of tectonic plate boundaries. State which are most likely to generate tsunamis and explain why. Identify the earthquake and bathymetric properties most likely to contribute to large tsunamis and use them to predict how big a hypothetical tsunami will be. Describe how tsunamis propagate, and understand the factors that affect their direction and speed. Understand the potential long-term effects of tsunamis. December 2017: The lesson Resources page was updated to include new and revised links to the US Tsunami Warning System main page and other materials. December 2014: New material added to the lesson includes information about the March 2011 Japan earthquake and tsunami. An updated programming template allows videos and animations to work across platforms on both personal computers and mobile devices.